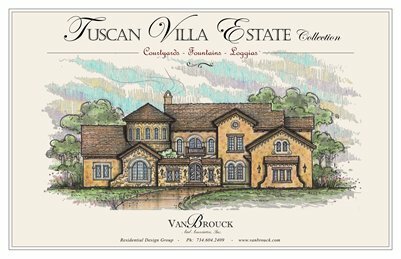 This beautifully designed & illustrated Tuscan Villa Estate Collection includes 18 creative & unique "Tuscany Style-inspired" Villa home designs with Old-World refined elegance. Drawing influence from European design & details with open-air courtyards, wrought-iron balconies, and sun-drenched interiors, these Tuscany Inspired homes are designed to integrally connect the casual-elegance of the indoor spaces with the abundant gardens that surround them. From age-old materials and authentic detailing to classic and fresh floor plans, these new Tuscan Villa designs are created to encourage a lifestyle of outdoor living & entertaining.